Oh melly, you don't know the half of it!!!! I'm making an appointment with my doc to have my xanax refilled! When you're surrounded by loonies on a daily basis, every little bit o' chemical and liquid courage helps. Looks like my neck of the woods (and probably YOURS too, by the huge swath of storm activity on radar), so battening down the hatches over here for a blustery, snowy Thanksgiving holiday. Hope all stay warm, dry and merry this weekend, eating your fill of turkey, watching your fill of football, getting your fill of family and in general, having a great festive holiday! A toast to you all and to all. P.S. If you're a wine drinker, Pinot Noir is a perfect pairing with turkey. Oh, and vodka pairs well with everything else! Ha! Lorna - just had the flu myself, still coughing a week later but as Lakin said the worst was the first 3 days - hope you get over it quickly. So what are everyones thanksgiving plans? Us Aussies don't celebrate it of course but I have a night out planned with about 12 women so we will be very thankful that we are out on the town minus our kids and hubbies for a change. TWELVE WOMEN?????? That's not a group, that's a herd! Wow, but sounds like a blast! Keep your clothes on, woman! Hey themmie, do you live anywhere near the world record holder for most Christmas lights? Saw on the internet it's a house in Australia. Lakin460 wrote: It must be a sign that I should make some and send everyone here a jar. What say, eh? Lakin460 wrote: Hey themmie, do you live anywhere near the world record holder for most Christmas lights? Saw on the internet it's a house in Australia. I think that IS theminis, isn't it? Lakin460 wrote: TWELVE WOMEN?????? That's not a group, that's a herd! Wow, but sounds like a blast! Keep your clothes on, woman! Yeah I live about 45 min drive away - we normally go each Christmas to this one street called the Boulevard in a town Ivanhoe (where all the poshies live and love that you know that). Almost all the houses in this street put up lights, but not just lights Im talking seriously good decorations - some of the occupants sing carols and put on plays etc - our kids love it. HA HA - I figured out Lakin was talking to me, but yeah could have been anyone! Oh no, I meant I thought that was your house! Not that you live near them, but it is you with the christmas decs. Sorry to be unclear! I´m taking my boy to Strasbourg chrismas market, just to be there, the athmosphere, lights, decorations. I don´t know how touristico it will be, but... there are little villages around with the same theme- so plenty to see I hope. to all who celebrate it. I'm on holiday by the sea with limited Wi Fi access so will have a major catch up on here when back home ! Hope all the poorly folk will soon be well again. That is SO COOL!!!! What a fun family holiday outing to go see it all. I love stuff like that, although I haven't decorated my house on that level. I'm more just a wreath and garland girl, myself. Throw on some white lights and red ribbon and call it day. Then I put my feet up and celebrate my accompllishment with some eggnog. It is a fun night, especially for the kids. We don't decorate our house to that extent at all, who needs higher electricity bills, not me. We hang chandelier lights all around the outside of the house, then those lights on netting we use to pop over the hedges and then we are done. The house you mentioned Lakin, they started their decorations in October then every weekend since, that's just lunacy. I don't decorate too much....one string of little lights around my door. But this house about 15 minutes ( a few towns over) from me does it up big. They have a website and everything. If anyone wants to view it the count down clock says in about 8 hours the webcam will go live....enjoy! Hi ho, hi ho, it's off to Clooney I go! Some of the most beautifully decorated houses I've seen (not gaudy with too many lights, very tasteful) are along Sunset Boulevard in Beverly Hills. There is one house that's East of the Beverly Hills Hotel that sits on a corner and it has the most awesome decorations, lights, lawn decor, etc. I haven't been there in about 3 years so not sure if the home is still owned by the same folks, but it was always eye catching. They're on the North side of the street (on your right if you're driving West) a few blocks after you leave the commercial area of Sunset. So I took the day off today - decided to stay away from all the folks at work with colds, flu, etc. Luckily, didn't catch what my boss had! Whew! Anyhoo, since I know this weekend will be busy at the flicks, decided to go to a morning showing of Catching Fire today. I really enjoyed it but it was funny at the end. Some of the younger gals were not happy how it ended. I guess they didn't read the books. HA! Obviously, there's still another book in the TRILOGY so that means there's going to be another movie - duh! Two young gals in the rest room afterwards were saying how bummed out they were that they'll have to wait about two years before the final film comes out. I guess though, the film makers did their job - anyone who sees this film is definitely going to go to the next one! Wonder if the producers made a three picture deal with these folks before the actors knew how much money this flicks would make? Then again, even if they did, considering how much they have and will make I'm thinking that Jennifer gal still has some good negotiating clout for the final film! HAVE A GREAT THANKSGIVING AMERICA!!! even if you don't celebrate the day where you live. Happy turkey day to all who are celebrating. And all turkeys, too! Ok, we've got falling turkeys, cornucopias (cornucopii? ), turkey drumsticks and I don't know what the little doodad is. Let me know if the decorations really slow down your COH experience! Warning not for the faint of heart or those easily offended. Happy Thanksgiving to you all lovely ladies! May you have a great one! Have a good one yourself. And everyone of course Happy thanksgiving! I saw on the news today that nearly everyone in LA was on the highway to get home for the holiday and the highway was so packed the the one side was full of white light (head lights) and the other side was full of red light (back lights). It looked amazing. But really...crazy traffic. 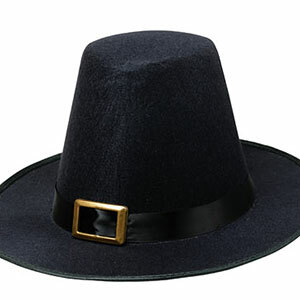 Not just any hats they're pilgrim hats! Cute! Carla I moved your question to December Chit Chat since it's probably going to get varied responses!